SMS voting is our second most popular option with voters because it is quick and easy. Voters can send their voting preference to a mobile number, then get a reply text to confirm that their vote is lodged. 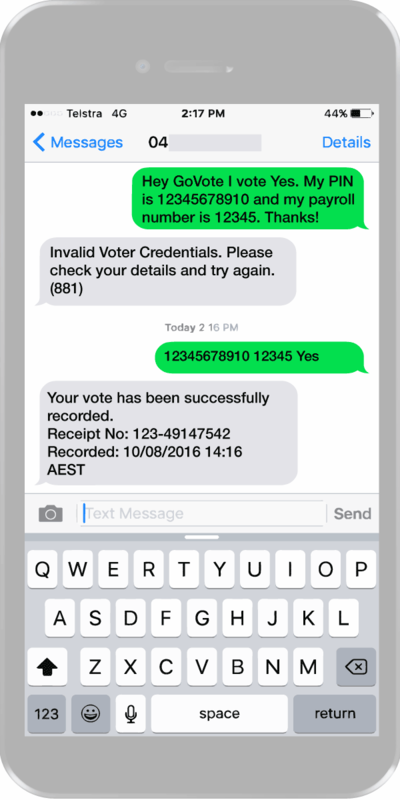 Our mobile phone voting service is automated and optimised for voters in Australia. Voters can lodge their vote anywhere they have mobile reception, at anytime during the ballot. We can also send voting information by text, so all voters need to do is reply to our message to vote. Votes are automatically counted in real time. System rules prevent invalid or multiple votes. Once the vote has been successfully submitted a receipt SMS is sent back to the voter. There are no expensive postage, material or handling costs associated with SMS voting. Voting only takes a minute using our mobile phone voting service. Mobile Phone Voting works best for one question ballots, like a vote on an enterprise agreement. The process is completely automated. To lodge an SMS vote, voters must send a text message in a specific format to a dedicated mobile number. A verification detail could be a payroll ID, member number or similar. Access will be setup before the ballot with either a PIN, which we call authenticated only, or a PIN and the additional verification item, which we call authenticated and verified. The verification detail would not be required for authenticated (PIN) only ballots. The voter sends their text message to GoVote’s dedicated mobile number. The voting preference will be recorded if the text message details and format are correct. Once the vote has been lodged, a receipt number is sent back to the voter’s mobile by SMS. This all takes less than a minute. The voter can use the receipt number to check that their vote was successfully lodged, which is a benefit that you don’t get with anonymous in person or postal voting. The text message is sent to the GoVote mobile number. If the text message format and authentication details are correct the voting preference will be recorded. A receipt number will then be sent back to the voter’s mobile by SMS. The voter (or an independent auditor) can use the receipt to confirm the vote was successfully lodged. This offers a level of transparency that you don’t get with anonymous in person or postal voting. The SMS voting channel doesn’t have detailed voting instructions built in. GoVote can send voting information by one or a combination of email, SMS or post. Generic instructions are also available online. Voters will need their 11-digit GoVote PIN numbers to vote. These are included in the how to vote instructions we send. We find that combining SMS communications and SMS voting is a great option for voters without email. Voting instructions will guide voters on the required text message format. It’s important that people stick to it. If unsuccessful a text message is sent back to the voter with details of the error. Simplicity on the outside, expert software on the inside. We work to make the SMS voting process as simple as possible without compromising on the fundamentals of security and anonymity. GoVote is Australia’s industry leader in the planning, management and delivery of secure, independent ballots and elections. We work across all industries with organisations big and small, public and private, including some of Australia’s most recognisable names. Our voting services can save you time and resources, and ensure your vote is conducted to meet any governance requirement. Get a detailed plan, obligation free, for your upcoming vote.